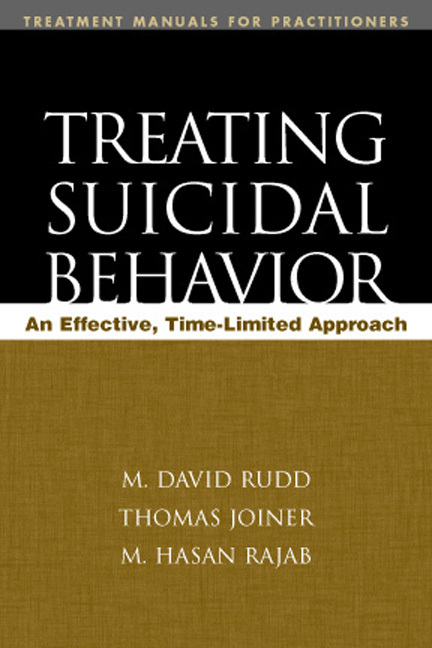 Grounded in a comprehensive model of suicidality, this volume describes an empirically supported cognitive-behavioral treatment approach. The clinician is guided to assess suicidal behavior and implement interventions tailored to the severity, chronicity, and diagnostic complexity of the patient's symptoms. Provided are session-by-session guidelines and clear-cut strategies for defusing the initial crisis; reducing suicidal behavior; restructuring suicide-related beliefs; and building interpersonal assertiveness, distress tolerance, problem solving, and other key skills. A special chapter covers risk assessment. Enhancing the book's utility are tables, figures, and sample handouts and forms, some of which may be reproduced for professional use.